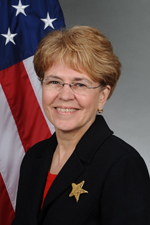 When renowned zoologist Jane Lubchenco was sworn in as President Barack Obama's director of the National Oceanic and Atmospheric Administration in 2009, she declared: "Science will be respected at NOAA; science will not be muzzled." Lubchenco's doctrine signaled a new day. Today, four years later, she would be the first to admit that her edict was a bit naive. Her foray into politics, which ends this month, has been a wild ride through a policy minefield. The first big media test for the former Oregon State University professor came in April 2010, when BP's Deepwater Horizon drilling platform exploded in the Gulf of Mexico, killing 11 workers and spilling over 4 million barrels of oil into the sea. Lubchenco was the administration's face in front of the cameras, stammering her way through convoluted explanations of what went wrong to a bewildered press and an outraged public. The next big test came a year later in the Pacific Northwest. In August 2011, federal District Court Judge James Redden declared that the U.S. government's biological opinion -- meaning its plan for bringing endangered salmon runs back from the brink of extinction -- had once again failed to meet the scientific requirements of the Endangered Species Act. For the fourth time in 10 years, NOAA, the agency responsible for designing and implementing salmon recovery efforts, was declared derelict in its duties. In the first case, Lubchenco was bushwhacked by the magnitude of the calamity and an administration dealing with its first full-blown environmental catastrophe. The second was manufactured by her boss, then-Secretary of Commerce and former Washington Gov. Gary Locke, and his ally, Democratic Sen. Patty Murray of Washington. Locke and Murray earned their political bona fides through unwavering loyalty to their state's utility industries and aluminum producers. Throughout the 20-year-long, $10 billion battle over salmon recovery, those loyalties have pitted them against fishermen and conservationists as well against their neighboring state of Oregon. When the battle over salmon recovery began 20 years ago, NOAA made a serious error when it gave the Bonneville Power Administration -- the agency that manages the Columbia and Snake river dams -- the upper hand in writing the recovery plans. Oregon joined with Indian tribes and conservation groups to challenge the first Clinton biological opinion. In all four trips to the federal bench, Oregon has prevailed. Yet somehow, thanks to Washington state politicians, the official loser in this game (the BPA) has always been allowed to keep the ball. After Judge Redden threw out the last Bush administration bi-op in 2009, Locke came up with a new plan: Let's tinker with the Bush plan, reshuffle the deck and resubmit it as the Obama plan. To make certain they hit no unexpected bumps along the way, aides to Sens. Murray and Maria Cantwell presented Lubchenco with a script on what to say when she travelled to Portland, Ore., for a hearing in Judge Redden's court. Despite these shenanigans, Locke's new biological opinion was dead on arrival in Redden's court. The judge took NOAA back to the woodshed, and a shamefaced Lubchenco told close friends that she had been handcuffed by politicians. Then she saw the light: While the BPA was suppressing "the best available recovery science" about salmon, politicians were playing the role of her ventriloquists. As a scientist, she knew the inevitable outcome of this contest would be extinction for the fish, so in May 2012, she directed the Northwest office of NOAA to form a task force of stakeholders to break the deadlock. The stakeholder approach would finally confront politicians and the BPA with the problem they have never been able to solve. Congress did not pass an Endangered Utilities Act or an Endangered Politicians Act. It passed an Endangered Species Act, and aquatic scientists are virtually unanimous in agreeing that extinction of the salmonids would be catastrophic for the Pacific Northwest's ecosystem. The specter of such a calamity never stopped the BPA or Washington Republican Rep. Doc Hastings from gaming the process. Yet Lubchenco's swan songa stakeholder process on neutral ground controlled by the best available science -- brings her back to her opening declaration: "Science will not be muzzled." While Murray has now signed on, Doc Hastings and the BPA remain opposed to the new approach because they know they can't win on science. More trustworthy heads are taking charge this time, and with all of the stakeholders finally at the table, salmon recovery may actually begin in earnest. Paul VanDevelder is a contributor to Writers on the Range, a service of High Country News (hcn.org). He lives in Oregon and is the author of Savages and Scoundrels: The Untold Story of America's Road to Empire through Indian Territory.